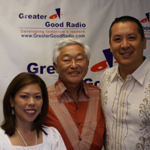 Greater Good Radio - Leaders Inspiring Leaders » SANFORD MURATA - President of Sanford Murata, Inc. In this Greater Good exclusive, Sanford talks about relationship and his belief in that relationships are created with the sincerity and values that one foregrounds. Surely, you will learn a lot as you listen to a man who has been there, done that. Find out all these and more only on Greater Good. Sanford Murata’s mission is to perpetuate the life of the land through its sensible and sustainable stewardship. He consistently seeks to create economic and social value, in collaboration with all stakeholders, by formulating and applying synergistic land use strategies and solutions which balance vision and inspiration with sound resource and risk management. Committed to improving the built environment while caring for the natural one, Sanford believes that land should be used with great prudence, anticipating and reflecting the concerns and aspirations of the community. After graduating from the University of California at Berkeley, Sanford Murata commenced his career as a real estate professional with Dillingham Corporation as a property analyst and manager. ·	Development and ownership of shopping centers, office buildings, resort hotels and residential condominium projects. ·	Asset and property management, brokerage and leasing of office, retail, commercial, hotel, industrial and residential properties. ·	Consulting for land use and development planning, programming and strategies. ·	Advisory and counseling services including real estate investment, market analysis, economic feasibility, financial pro forma, marketing plans, valuation, requests for equity and debt financing, requests for qualifications and proposals, work out and turnaround plans and exit solutions. ·	Receiver and Bankruptcy Trustee for retail and commercial properties. As a founding principal in 1988 of the full service real estate organization Graham Murata Russell, Sanford participated in numerous projects, as a developer / investor and as an adviser / consultant to landowners, developers, corporations, financial institutions and others. From July 2001 to September 2003, Sanford served as Director of Kamehameha Schools’ Commercial Assets Division, where he organized and directed the asset management, development and planning functions for the Schools’ $1.2 billion commercial real estate portfolio. As the Division’s first director, Sanford laid the foundation for creating and enhancing the value of major properties and formulated asset strategy plans for other key properties owned by the Schools throughout Hawaii. Since September 2003, Sanford has been involved in various investment advisory, asset management, development and consulting projects. ·	Development consultant and team leader: The Kakaako Waterfront, a mixed-use project ($650 million) proposed to be developed by A & B Properties, Inc., on 36 acres of waterfront land owned by the State of Hawaii, consisting of an amphitheater/performing arts cultural center (10 acs. ); a dining, entertainment, retail village (220,000 sf); three residential condominium buildings (950 units); and marina and marine facilities. The state decided not to proceed with the project. ·	Development consultant: A commercial-retail town center on 90 acres planned for a new residential community being developed on 3,700 acres at Waiawa in Central Oahu. ·	Development consultant and team leader: Preparation of a proposal in response to University of Hawaii’s Request for Proposals for a new student housing complex to be developed on the University’s Manoa campus. The team was one of the finalists. ·	Development consultant: Preparation of two Requests for Proposals for the University of Hawaii for 1) the development of a new Cancer Research Center of Hawaii facility ($200 million), and 2) the second phase of a research component for the John A. Burns School of Medicine campus ($100 million); and the management of the process to identify and select the developer and negotiate agreements with the selected developer. ·	Consultant: Preparation of a strategic plan for the redevelopment of three resort hotels in Hawaii. ·	Consultant and real estate agent: Preparation of a strategic plan for the redevelopment or disposition of a restaurant property in Waikiki. ·	Consultant: Preparation of a plan to reposition and lease the retail component in three resort hotels in Waikiki. ·	Consultant: Preparation of a strategic plan for the redevelopment or disposition of several contiguous commercial properties located in the urban core of Honolulu. ·	Director in charge: Preparation of a strategic plan for the Commercial Assets Division and attendant development action plans, and establishment of a system of operations for managing and measuring the Commercial Assets portfolio. ·	Director in charge: Preparation of Framework Plans for Kakaako (approx. 250 acs) and Moiliili (approx. 100 acs); repositioning, turnaround and renovation plans for Royal Hawaiian Shopping Center (283,000 sf), Windward Mall (530,000 sf) and Hawaii Kai Towne Center complex (319,000 sf); and renegotiation of the ground lease for Pearlridge Center (1,450,000 sf) and the ground lease and development agreement for Waiawa (3,700 acs). ·	Director and team member: Preparation of a Master Plan for Keauhou (approx. 2,000 acs). ·	Principal and partner in the development and management: ANA Kalakaua Center (152,000 sf) and Lanihau Center (87,000 sf). ·	Principal in consulting engagements: Victoria Ward Master Plan (65 acs), Outrigger Beachwalk hotel, retail, condominium mixed-use project ($400 million), Outrigger Ala Wai Gateway convention hotel project (1,000 rooms), redevelopment of Guam Shopping Center, and numerous land use and development plans. ·	Receiver and Bankruptcy Trustee: Aloha Tower Marketplace (165,000 sf). ·	Development manager: Embassy Suites Resort (413 suites) and Sanki Kona Resort (1,100 rooms). ·	Partner and project manager in the development of: Maui Marriott Resort (720 rooms), Discovery Bay (668 condominium units), Discovery Bay Shopping Center (40,000 sf), Holiday Inn Coconut Beach Hotel (311 rooms), and The Queen Street Building (66,000 sf).